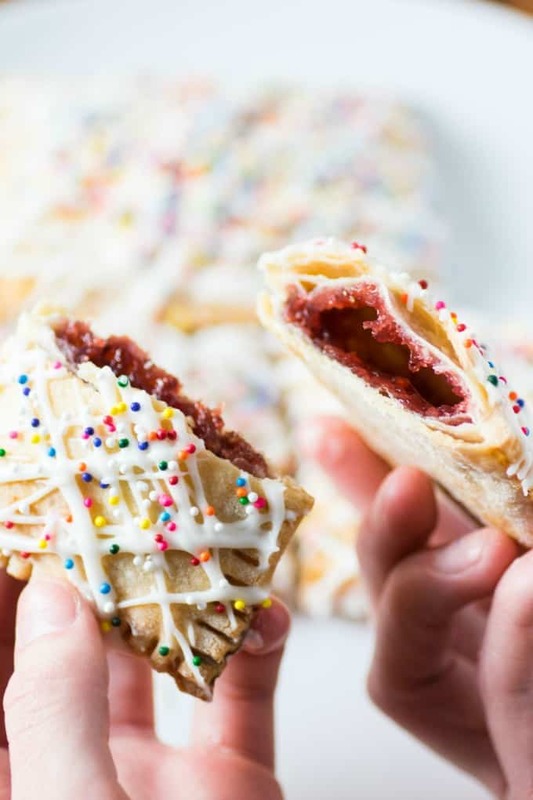 Homemade Pop Tarts will bring back the kid in you, find your flavor! Pop Tarts were something that I was not really allowed to have as a kid. Kind of dessert for breakfast but then doesn’t that intrigue you more as a kid? 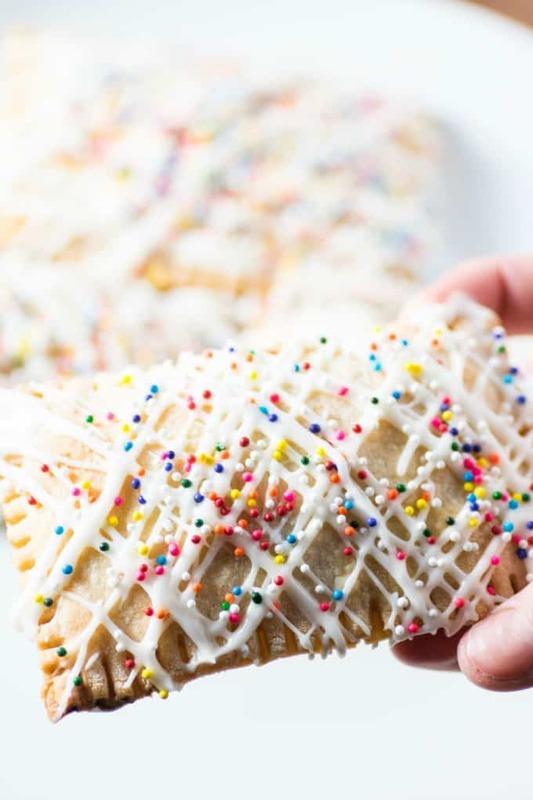 Amber made these very pretty and easy Homemade Pop Tarts as a fun project. They are made with easy store bought pie dough and jam. Then a simple drizzle of icing and sprinkles and you have something very nostalgic and fun to eat!! Now this screams childhood to me!! What fun!! Your kids would be thrilled to see a delicious treat like this waiting for them when they come home from school. I love how she criss-crossed the icing and then used simple sprinkles. They make you smile just looking at them!! Young and old will love eating and making these also as they are very easy. Like I said nothing is complicated when you use store bought pie dough and jam or preserves from the store also! Pop Tarts came about in 1964 by Kellogg’s and were meant for your toaster oven or microwave. 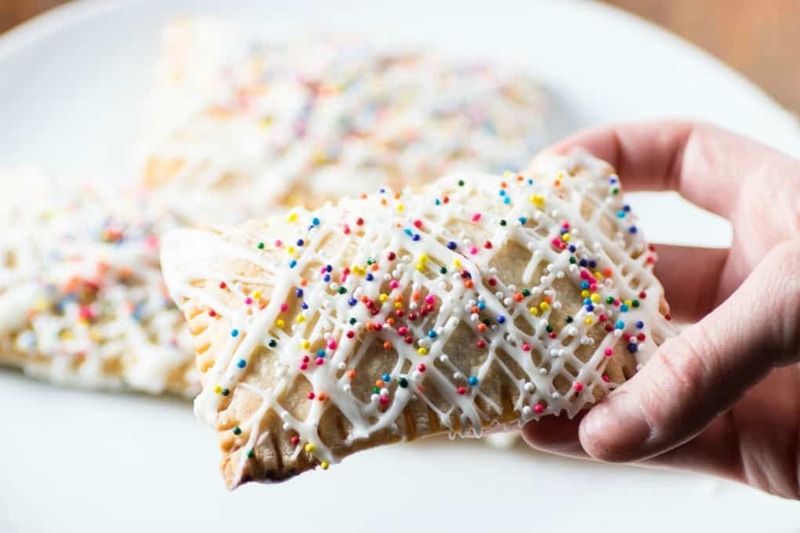 These pretty Homemade Pop Tarts shouldn’t go in the toaster or microwave as your icing will be a runny mess. Just simply enjoy them after they are decorated or cover and keep at room temperature. They surely won’t be around for long! And inside, you can fill it with any jam you love!! She used strawberry jam and kept it quite traditional but you can use whatever you like! There are lots of flavors of Pop Tarts so do a bit of experimenting to find which ones you like the best!! If you are a chocolate lover I can see having a nice layer of hazelnut chocolate spread inside being delicious. Make your own creation today!! Have fun! Enjoy! 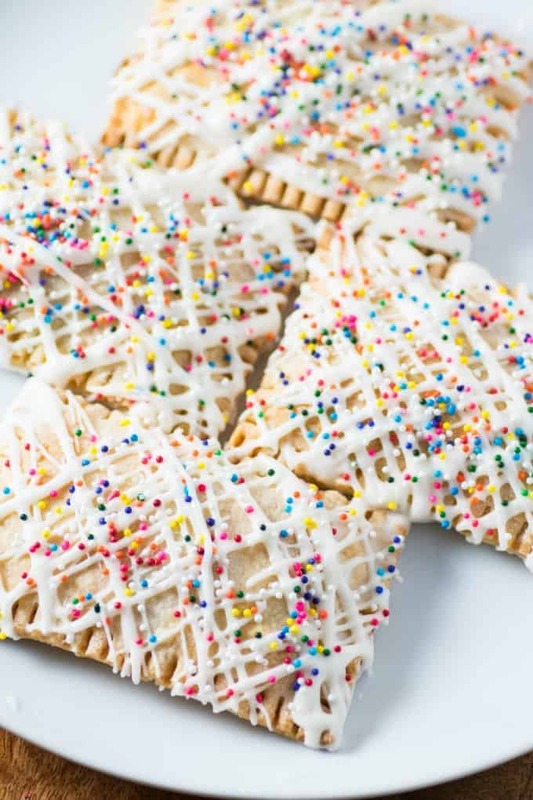 Homemade Pop Tarts will bring back the kid in you! They make the perfect indulgent treat for when kids get home from school! Mix the jam and cornstarch together in a small bowl and set aside. Whisk the egg in a small bowl and set aside. Lay out the pie dough onto a floured work surface. Using a knife or pizza cutter cut off about an inch on the sides, top and bottom to create a 9" square. Cut three 3" strips out of each square. Place one to two tablespoons of the jam mixture on each strip and spread out on half the dough but not completely to the sides. Brush the egg around the edge of the rectangle. Fold the dry end over the jam end. Using a fork seal the edges. Place the Pop Tarts on the baking sheet and bake for 15-18 min. until golden. Whisk the powdered sugar with the cream until you get the right consistency. Drizzle or spread onto the Pop Tart. Immediately add the sprinkles and leave to dry. Serve at room temperature. YUM! I love that you can make Pop-Tarts at home! I’ll try this recipe this weekend! Oh boy! Home made Pop Tarts sounds like a great way to bond with the kids in the kitchen. Yours turned out amazing! Home made pop tarts sounds like a great breakfast idea to do with the kids. I feel it will encourage them to learn to cook and bake. These look so delicious! I love pop tarts with a passion. I’ll have to try and make these this weekend! These would be so fun to make. They sound like they’d be really tasty with strawberry preserves. 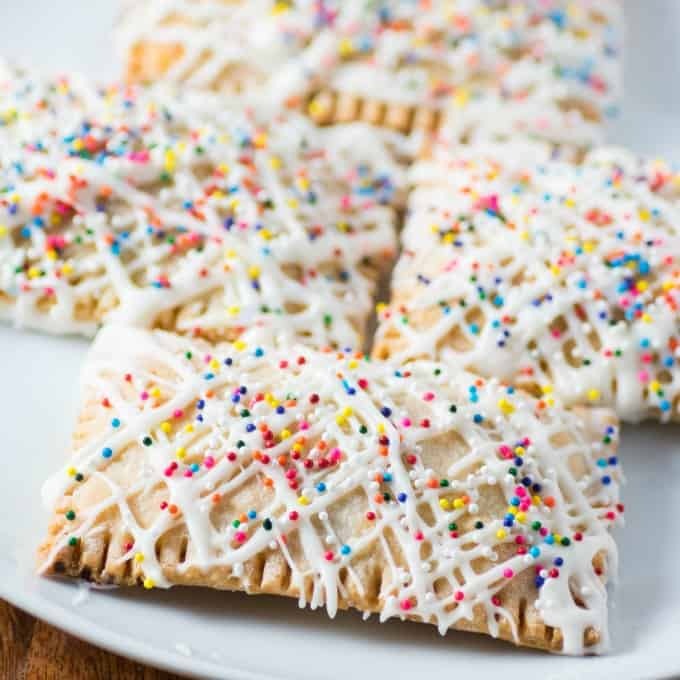 Your homemade pop tarts are just so cute and colorful and I totally love them! Is it wrong that I want to make them just because they’re so insta-worthy?! OH man. My daughter and son in law passed by as I was looking at this post and they already have put in a request for me to make these. I love that if I made them at home, I could customize them to our liking. YUM! I have always wanted to try to make my own. 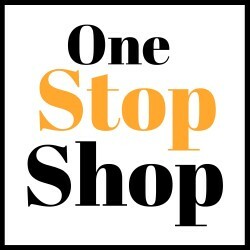 So much more better for you than the kid in the stores! Ooh. These look really yummy. I have to admit that I’m a pop tart lover from way back. Will definitely be giving these a try. Oh I have to try to make these for the kids. That filling looks delicious! You had me at POP TARTS! Those sprinkles are my daughter’s favorite. She saw them and said: MOM, when are you making this recipe! I just started making these with my kidos and they love them! I love how you added sprinkles – this makes them way more fun than what I was doing! My family loves Pop Tarts. I’ve tried to make them before but this recipe looks so much easier. I’m going to give this a try with my daughter.